OADC Neutral Membership is for legal educators who satisfy the criteria below, or who do not maintain an active practice, either plaintiff or defendant; existing members of the state or federal judiciary; and practitioners who devote their entire practice to performing arbitration/mediation/reference judge services. Legal educators must be active attorney members of the Oregon State Bar who devote a substantial portion of their practice to representing the interests of individual defendants, businesses, insurance companies, or government entities in civil litigation. Neutral members are on-voting members of association. Membership dues are $190 for the first year of annual dues, and after the first year of annual membership, annual dues are $290. OADC dues are not deductible as a charitable contribution for federal income tax purposes, but may be partially deductible as a business expense. OADC estimates that 82% can be deductible as an ordinary and necessary business expense. Please log in using your Username and Password below. If you don't know your Username and Password, use the "Forgot Your Password" link on this page. Brand New to OADC and Want to Join OADC? If you would like to join OADC by completing the on-line membership application, please begin by entering your email address below. 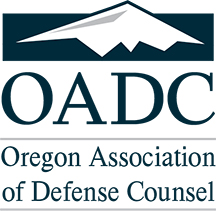 By providing your email address, you agree to receive emails from Oregon Association of Defense Counsel.